Here is a list of Frequently Asked Questions on the topic of American style darts . . .
Is it true that when you throw three in the blue, you get to kiss the bartender? - not when I'm bartending. 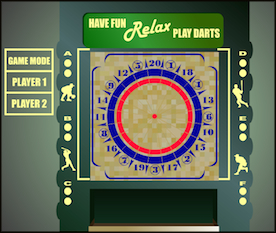 What do they mean by, "Have Fun, Relax, Play Darts?" - I have no idea. Whoever wrote that was either terribly good at the game, or had no idea what he was talking about. He probably ought to be shot, right in the pinky toe. Anyone who ever had 2 to tie, 3 to win, and saw thier last dart kick out into the blue was anything but relaxed and having fun. I've never played American Darts, what is the object of the game? - The common game is baseball. But, if you look through the site you'll see there are dozens of different games you can play on an American dartboard. One of my favorite dart lines is that the object of the game is to "hit what you're aiming at". If you can do that, you'll do well in any game that's called. Why are the innings numbered the way they are, instead of in order? "- ok, no one really asked me that one, but I found the answer on the internet, and I wanted to make an excuse to link over to it. Here's a short article on the numbers on the dartboard. Don't you "heel" the line?- it depends on where you live. I've recently found someone who plays in an area where it is commonplace to "heel the line". Still, this is not the accepted practice for the State or National tournament. If you're just starting out, shoot from behind the line for a couple of reasons. It's more commonly accepted (see the rules for Nationals and States), and it's a natural occurance for darts to drop during the evening. If you are used to being closer, and have to move behind the line to shoot, your darts will already tend to drop. Once fatigue sets in, you'll really be screwed. While we're on the topic of shooting line infractions, let me say that when you see someone shooting from over the line, you tell them before they throw the dart. Don't wait until they've made the throw and then try to disqualify the dart. Isn't the distance from the cork to the throw line 9 feet?- The ABDA says it's 107.5", Widdy puts it at 106.4". Nine feet is 108", so that's just a tad too far. But, it's easy to remember, easy to measure, and certainly close enough for rock and roll. What do you mean, "the math" from the cork to the throw line?- It's the a² + b² = c² Triangle thing. Front of board to the line = 7'3", or 87" (squared it's 7,569)Add those two (11,538), and take the square root (107.415")That's the ABDA numbers, using a calculator with a square root button on it. What's a good dart average?- anything better than your buddy's average. If you really want numbers, you can browse through the averages listed on this page for some real-life examples of what others shoot. I'd say in the 20's is a recreational shooter, low 30's is a regular dart shooter, mid to upper is competitive, in the 40's you'll find the big dogs. Anyone averaging 44 or better is world class. What's the Highest Game ever Shot?- I have no idea, but it probably took place in a smokey barroom with 9 people in it. The high games listed from the PA State tournament are 61 this year (2006), and the highest I've ever seen with my own eyes was a 65. Update: I spoke with one of the gentlemen involved in running the 39th Annual PA State Darts Tournament recently. He assured me that several players had hit a 72, and told me their names and the stories associated with the games. I forget the names, although I'll probably remember the stories. The one scoring recap for one of the games was three whitehorses, three 8's, and three 7's for a total of 72. What happens when one dart sticks in another, do you get twice the points of the dart that's in the board?- NO. You only get points for the darts that are in the board. The dart that stuck in the barrel doesn't earn any points at all. What's the deal with a potato?- it just slicks up the tip of the dart. Helps it to stick into new boards easier. There is nothing secret about the potato itself, a shotglass of water would work as well.